The third and final recipe in our series about oboes, oranges, and almonds will be a welcome addition to your next breakfast, brunch, or even tea time. 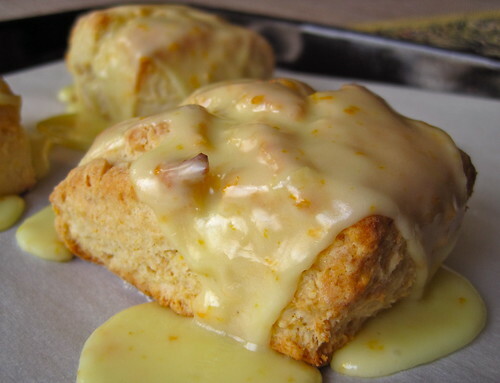 These scones are crisp on the outside, full of almond-y goodness on the inside, and covered with a sweet orange glaze to tie it all together. You can bake them all at once, or store them in the freezer (keeping the glaze separate) to bake as many or as few as you’d like at a time. Preheat oven to 375-degrees. Line a baking sheet with parchment paper. Finely grate the orange zest then juice the orange, reserving 2 tablespoons of juice. In the bowl of a food processor, combine the flour, leavenings, salt, cinnamon, almond paste, and half of the orange zest; pulse 5-10 times until combined. Add the chilled butter pieces and pulse until the mixture resembles coarse meal and a few small lumps of butter remain. Pour the mixture into a large mixing bowl. Combine the buttermilk and amaretto in a measuring cup; stir into dry ingredients with a wooden spoon or rubber spatula until evenly moistened and dough holds together. Dough should be fairly dry but hold together when pressed against side of bowl. Turn dough out onto lightly floured work surface. Pat into a rectangle 6 x 8 inches and approximately 1 inch thick. Using a bench scraper or large knife dusted with flour, cut the dough into twelve squares (or any shape desired) and place on prepared pan. At this point, if you don’t want to bake all of the scones, you can freeze the unbaked scones on a parchment-lined sheetpan, then transfer to a freezer bag and bake within 3-4 months. Bake in preheated oven 20-25 minutes or until firm to the touch and golden brown. Remove from oven; cool for 5-10 minutes on a wire rack. Meanwhile, combine the reserved orange zest and juice in a small bowl with the confectioner’s sugar and a pinch of salt. Stir until a glaze is formed, adding a bit more confectioner’s sugar if necessary. Glaze should crystalize slightly when left standing for a few minutes. 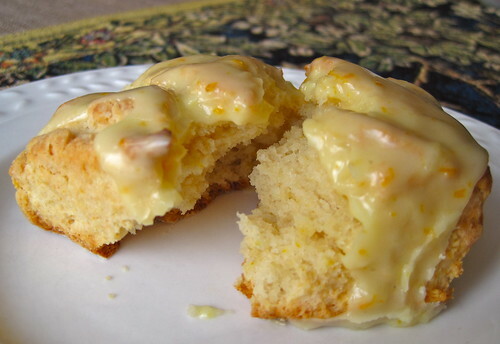 Glaze tops of warm scones; serve warm or at room temperature. 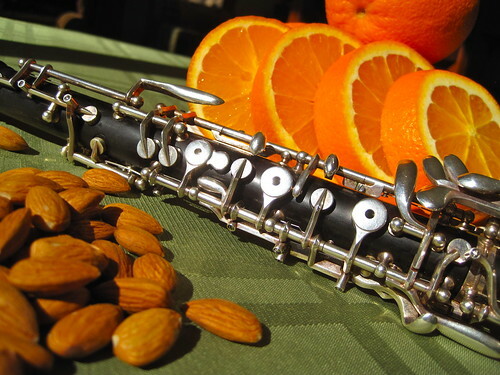 Oboes, oranges, and almonds… the perfect brunch soundtrack. These looks and sounds delicous! Of course…it always does. Thanks! Let me know if you give them a try. We’re still hiding away two of these in the freezer for a rainy day!